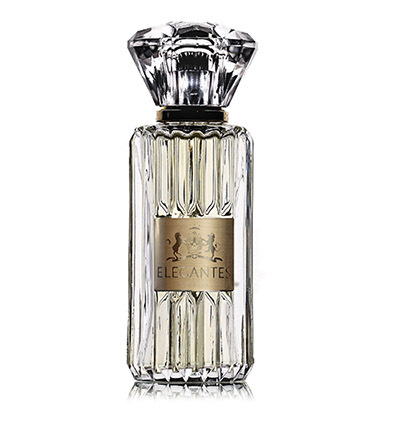 Personality by Elegantes is a range of exquisite perfumes presented in beautiful 100ml glass flacons. They have been developed to suit a range of very special personalities – a natural extension of who you are. The Elegantes London team has travelled the world to source the finest ingredients, championing small farmers and producers who share the Elegantes ethos of sustainability and passion for excellence. No stone is left unturned whether it’s on remote islands sourcing the most sustainable vetiver, or searching out the best source for hand-picked roses to become beautifully-blended rose oil and absolute. Rich, multi-faceted, unique, charming, and feminine. Delicate, sensual, sweet, lovable, intimate and discreet. A contemporary interpretation on the classical floral musk, this perfume is fresh, elegant and charming. Featuring a unique blend of citrus and linen accord, the white flowers at the heart make it the perfect complement to summer in the city. At the base discover hints of vetiver and golden amber intertwined with patchouli. Ultimate Musk is an experience filled with freshness, warmth and a touch of sensuality. Exotic elements from the East, including oud and saffron, are combined with notes from the West, such as white flowers and vanilla. The interlacing of these captivating elements is warm and deeply textured. The addition of precious oud adds a dash of sensuality while crushed cardamom kicks in a bit of frivolity. At the base are the rich aromas of amber, musk and cashmere woods evoking soulful memories of the Arabian Nights. This is the ultimate scent of seduction, the full arsenal a man or woman can deploy to capture the love of their life. A warm, gourmand evocation of sensuality, this blends a deep cedarwood extraction with a gin accord in the background, the warm intensity of benzoin resinoid and leather and uses Haiti vetiver oil to connect them all together. Elegant, educated, sophisticated, eloquent, charming and confident. An elegant, yet alternative take on the classic rose scent. The sweet and soft violet tickles the senses and captures the attention. Move deeper into the perfume and discover an aromatic floral explosion of identifiable rose mixed with fresh white flowers. The woody base consists of sandalwood and musk ensuring longevity and evoking warmth and a comforting sense of security. Its inspiration is the quintessential English aristocratic couple: the husband with a freshly-picked boutonniere in his lapel and his wife in a floral dress carrying a trug filled with David Austen roses from her garden. Floral, sophisticated, joyful and inspirational. Noble, powerful, educated, original, complex, elegant and refined. This perfume opens with bright bergamot and saffron complimented by a cool mix of fresh lily of the valley and cedarwood. As it melts into the skin, the smoky accord of oud wood emerges with a multitude of amber and sweet musky notes. What an intriguing twist to the traditional woody oriental perfume. The wonderful originality of this perfume is that it plays on contrasts. Clean versus ambery/animalic, fragile versus solid, smoky versus resinous. It starts with a strong, incense top note, airy, clean, spiritual that is pushed by a clean aldehyde giving a mineral impression, as well as laurel leaf. It is immediately followed though by a smokier, burnt facet of the incense, pushed by leathery notes and the warmth of pimento berry. Then comes the resinous and wrapping notes of myrrh, cistus labdanum, olibanum resin and sandalwood. A hot aromatic perfume this is a bold but sophisticated creation that is both warming and enveloping and sets the wearer apart. A smoky fragrant story it is built around an old English club with the smell of leather and tobacco in the air, wooden floors, and a fresh bouquet of flowers on a table. This is an intimate, cosy and elegant perfume. Vetiver is one of the most aristocratic notes in perfumery and has an amazing complexity of character. To explode its facets it’s blended here with sandalwood, grey amber and grapefruit to push it into a spicy territory so that it becomes woody, dry and ambery and is also very long-lasting. This is a very distinguished perfume and an interpretation of a very exclusive and elegant way of life. Exotic, distinctive, ethical and honourable. This scent is rare, exotic and distinctive. It is created using oud, one of the rarest and most precious ingredients. Oriental leather gives way to the smoky blend of rare oud wood to reveal the most exquisite perfume in the collection. This is a three-piece suit of a fragrance, the eternal triumvirate of bergamot, myrrh and tobacco that masters complexity, to deliver simplicity. This fragrance delivers aristocratic notes for wearers of distinction, presence and great standing. After all, Elegantes is a ‘way of life’.